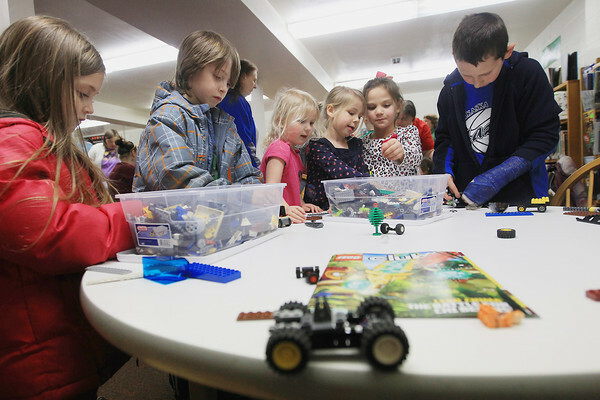 London Birgy, from left, 5, Beck Birgy, 7, Addie Gelinas, 4, McKenna Gelinas, 5, Annie Ponstein, 7 and Tyler Guggemos, 8, all of Kalkaska, play with Legos Wednesday, April 10, 2013 during the Lego-Rama event at the Kalkaska County Library. A "Star Wars"-themed Lego event is scheduled for Saturday, May 4 at 1:00 p.m. titled "May the Fourth Be With You," at the library with trivia and prizes planned. Costumes are also encouraged for the event.